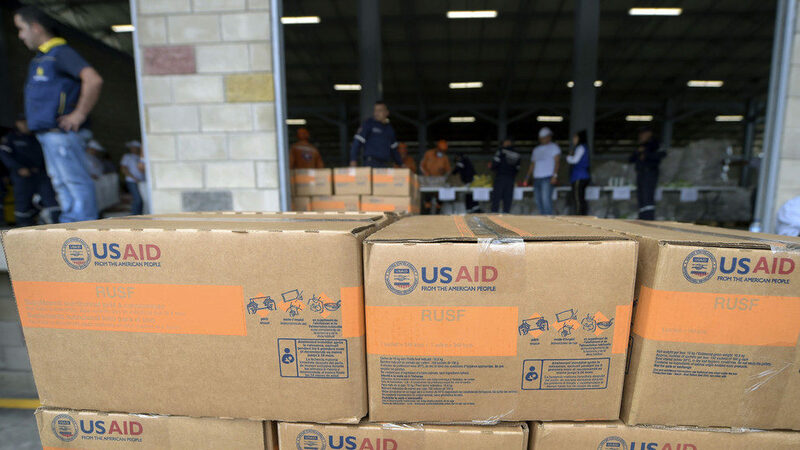 This weekend, the humanitarian intervention began to unfold when the coup president, JuanGuaido, announced the imminent distribution of humanitarian aid. Guaido announced the aid would be gathered at three points, and Venezuela’s army would be pressured to allow it into the country. The collection centers will be in Colombia, Brazil and on an island in the Caribbean. He announced aid will begin to be distributed in the coming days. He claimed the Venezuela military will have to make a decision whether or not to let this aid in to Venezuela. Guaido said he wants the people to play a supportive role by staying in the streets with demonstrations that will be announced soon. Washington’s decision to send aid to Venezuela now is pure hypocrisy as it was the US that caused the nation’s economic woes with its sanctions, Vice President Delcy Rodriguez told RT. She believes the aid foreshadows an invasion. “We say: ‘yes to dialog’ and ‘no to war’,” Rodriguez said, adding that her country has been facing “total political and ideological rejection” by the US and some of its allies. She also accused Washington of directly “giving orders” to the opposition led by Guaido. Her words came less than a day after Guaido told AFP he could potentially “authorize” a foreign military intervention to topple the elected president Maduro. Over the last two weeks, the US administration also made it clear that the military option is not off the table if Maduro refuses to voluntarily surrender his power and launch a ‘democratic’ political transition in Venezuela. As Venezuela continues to struggle with an economic crisis and hyperinflation, Guaido, who has been recognized by the US, its regional allies in South America, as well as several western nations, has called on his international support base to send humanitarian aid. The US promptly complied with this request but the convoy was stopped at Venezuela’s border with Colombia as Maduro refused to let it in. This development further escalated tensions in the Latin American country as Guaido called on his supporters to continue protests until the ‘usurper’ Maduro lets the convoy in. Meanwhile, Venezuela’s Supreme Court judge in turn accused the opposition leader of an attempt to usurp presidential powers.